cover design © 2008 Ardy M. Scott. "It's a Black Robe. Probably the new priest!" Were they speaking Upper Pima? Hazy figures and hovering silhouettes crowded around, peering down. I was not on the mule but on my back, with something fuzzy underneath, a blanket maybe. The dark mound looming above me wavered and became a mud and stick hut that threw its shadow over me, but the glare from the sun just beyond it still hurt. My eyes squeezed shut in protest. "Is he drunk?" asked another voice. "No, idiot, he's sick! He needs the medicine man! Send someone for Jevho, the maakai." "The healer's at Sonoitac. We'd better get the priest to the mission at Guevavi. Jevho can go there. It's closer," said the original voice. Many hands lifted me onto my mule. They waited. I waited too. I clung to Conejo's bristly mane, weaving but not falling. "Shoiga! Walk beside him and catch him when he falls." But I did not fall. A few times, Conejo gave a little hitch to balance me, like a father making sure the baby sits squarely on his shoulder. The sun was on its way toward the horizon when we came in sight of the mission church, a bell hanging in an arch over the door, an unfinished tower at its left corner. A square compound enclosed by a six-foot adobe wall extended from the right side, the gate sagging open. The procession halted, waiting for me to get down. I pulled a leg up and over Conejo's back, but my foot hung up in the stirrup. "Shoiga, grab him! He's falling now!" The young man who'd walked beside Conejo caught me and set my feet on the ground. He smelled of sweat and his cheek against mine was slippery with it. Another arm thrust under my armpit and snaked across my back. They half carried me through the compound gate and into a cell in the unfinished convento. The tiny room was full of sand, debris, straw, sticks, and cobwebs in the corners that looked like lairs of black widow spiders. A fireplace-oven filled one corner and a warped table stood, flanked by a single chair, with only three legs touching the earthen floor. In the opposite corner stood the bed, the frame bound together with dried rawhide strips. It was made of mesquite branches, unpeeled, but without thorns as far as I could see. Rawhide thongs also spanned the width of the cot to support whatever mattress could be devised. "Wu'ai! Get his saddle pad and his sleeping blanket. Take the saddle, too. Lay them on the bed." I croaked a few words in their language, but there was no word for 'violin,' so I ended in Spanish. "The package behind the saddle! Bring my… my violín!" Wu'ai nodded and returned a moment later to make the bed that only a mystic from India could find comfortable. Someone, Shoiga maybe, wedged my saddle at the head, then with grunts and groans he and Wu'ai picked me up and stretched me out, pulling my robe down to cover my shins. I groped beside the cot to see if they'd brought the violin as I'd asked. Wu'ai lifted the case so I could see and touch it. I sighed and gave a little murmur of satisfaction. A hand lifted my head. Had I slept? A wizened little woman bent over me and poured drops of water on my parched tongue. She then sponged my burning forehead and cheeks with a wet rag and cleaned away crusts at the corners of my mouth. I smiled with gratitude and her pleated lips stretched wide in response. I next opened my eyes to semi-darkness, the tiny cell lit only by a fire in the oven. Flickering light played upon the wrinkled woman, and, near my bed, on a man and a young woman. Was I awake? I blinked to make sure. She was striking rather than beautiful, tall and slender, part Indian, with high cheekbones, a prominent nose, and dark skin. But, incongruously, the firelight gleamed on chestnut red hair pulled back and tied in a knot behind her head, and a soft forest of wisps framed her face. A leaping flame made her dark eyes seem blue. The man was a bit shorter but powerfully built, with broad shoulders and massive arms. His chest was bare except for a necklace of bear claws interspersed with macaw or parrot feathers. He wore wristlets, the feathered one on his left arm might be yellow and green—hard to tell by firelight—bear or wolf claws on the right, and a mask on his upper face. One hand held a rattle; the other a pipe giving off a peculiar-smelling smoke, unlike tobacco. I blinked again. Surely, this pair was a figment of my fevered mind. The man began to dance in rhythmic motion, uttering guttural sounds and keeping time with the rattle. At intervals he filled his mouth with smoke and blew it into my nostrils and mouth. I could not avoid inhaling it. Before long, my body drifted, light and remote, free of pain. He gave an order in clear Upper Pima. The red-haired woman moved toward the oven, and the crone handed her a clay vessel full of liquid. Warm vapors wafted from it when the young woman raised me by the shoulders with surprising strength and pressed it to my lips. The contents were bitter but cloying. I gagged, then gulped it down and lay back with a sigh when she released me. The warm potion soothed my raw stomach. The medicine man continued his weaving dance, fanning me with an eagle wing, chanting in what seemed to be archaic Pima language. He might be invoking the names of strange gods, gods of the earth, of the storm, the ruler of all flesh, who were to come to my aid. If this were Devil-worship performed over my helpless body, I should feel fear and loathing, but instead I felt a visceral connection to this man who held my life in his hands. He became my protector, my brother, my father. I was like an infant, totally at his command. My panting breath sounded loud in my ears as I tried to reach out to him. Then the dancing and chanting ceased. With me, the Black Robe would not need a drug. Our maakai is intoning his incantation—an especially powerful one, I think. That means he believes this man to be gravely ill, on the point of death. He says the priest has one of the wandering sicknesses, easy to detect, and not needing a long Dúajida ceremony. I think we Irish call that a "diagnosis." I watch Jevho, thrilling at his beauty, wanting to reach out to him as this poor priest just tried to do. My two natures, Indian and Irish, are at war inside me. I am the maakai's apprentice. My Pima mother, Hohoi, wants me to carry on her family's traditions, even though she now goes to church with my father, Patrick. I'm here thanks to her, learning everything I can about Jevho's art and his faith. For he has a faith—deep and abiding—that rivals and in some ways contradicts the one the Spanish have brought to this land, and the one my father believes in. I'm not sure just what my mother believes, in her heart of hearts. I'm torn between the power of Jevho's lore and what the Europeans have taught me. I believe in the power and authority of Nature and what She tells us. And yet, the missionary I knew best, Father Gustavo Holzmann, told me to resist my natural impulses. Sad for him he didn't—couldn't, perhaps—resist his! I'm eighteen years old, and I've lived a great deal, had many experiences of the awe-inspiring power of Nature. I learned the most important lessons not from my Indian relatives and friends, but from the Spanish or the Irish, who profess not to believe in Nature but only in the Christian God. My uncle Michael was one of my most important teachers. He's been gone for days, and my father is frantic about him, I can tell. He hasn't said much, but he walks the floor and snaps at mother and me. The maakai tells me he knows where Uncle Michael is, but he refuses to reveal what he knows. I watch Jevho weave his spell over this new priest. I marvel at the beauty of his smooth, dark skin, shining with sweat, revealing the undulations of his powerful muscles. He knows how to use his body to fascinate and heal. Now I study our patient, the priest. He is also beautiful, if a dying man—almost skeletal—can be considered so. His face has perfectly molded features: a prominent, hawk-like nose that gives him character, good cheek bones, a strong chin and jaw line, and yellow hair. I haven't seen hair quite like that before. It's lighter and finer than Uncle Michael's or my father's. His eyes are a clear, bright blue, if I can trust what I see in the firelight. They seem larger than normal because he's so thin, striking even though the whites are darkened with his illness. His mouth is wide and curving, as if he'd smile a lot if he were well. If he recovers, I think he—with his Christian message—will be a worthy opponent for our maakai, if he recovers. But he is dreadfully weak. Right now, he seems to want to reach out and touch Jevho again, but he's too feeble to lift his hand more than a few inches off the cot. My master the maakai blows another puff of that new medicine, marijuana, into the poor man's mouth. He has brought it back from his trips much further south to visit his mother's tribe, the Tarahumaras. Other medicine men here don't know the new drug or its power. The priest is already drunk on the smoke; his pupils are dilated. My teacher wants to lessen his discomfort and put him to sleep, I think. My mother taught me these missionaries are special human beings, set apart from the rest of us, not allowed normal human relations. I pity them, and especially this one. I long to mother him, hold him, caress him, and sing him to sleep. With me, he would not need a drug. The maakai asks for the potion with the white powder, which I give to the priest. I lift him ever so gently, my arm under his shoulders. How thin, how light he is, poor man! He drinks the potion, choking and making a face at first, then accepting it. Jacinta has made it sweet enough to be tolerable. At last, Jevho is through with his cure, and I sit on the cot next to the priest. I tell my teacher the priest is handsome. I cannot resist touching him. I stroke his face, my index finger outlining his lips, touching his nose, tracing his eyebrows. I smooth his hair back out of his eyes. He looks at me with a question in those bright eyes, his blond eyebrows raised a little. Now, he relaxes and his eyes close. I know that with me, he would not need a drug. "He'd be handsome if he were not such a skeleton, don't you think, Maakai?" the young woman said. He merely grunted. She sat on the edge of my cot and caressed my face, smoothing the hair out of my eyes, her fingers soft and cool on my fevered skin. "Handsome if you like bleached-out skin and corn-silk hair," the maakai replied. I squinted to see him better. Maakai means healer, and can be a title like Father or Doctor. His name was Jevho—had I heard right?—the name of a bobcat or lynx, probably his spirit or totem animal. The healer removed his mask, revealing rugged features with a heavy brow ridge and a jutting nose, his black eyes peering out with a fierce gleam. He might be in his mid forties. He nodded toward the old woman. "I'll leave the powder and the syrup here with Jacinta. She must give him daily doses. He has had the repeating fever, the shaking fever, for a long time. Traveling for days in the heat of the sun with a raging fever would have killed a stronger man than this one. He's been touched by the sun as well, maybe too far gone for the Spirits and the powder to help him. Only time will tell." He rose and turned to Jacinta. "Give him more of this twice every day, starting tomorrow, and let me know when you run out. See if you can get him to eat something. Try pinole, and boil some of his jerky and give him the broth. If you have chia seed, grind it and mix a handful into his pinole every day. He must have food he can keep down if he is to improve." He glanced at the red-haired woman and jerked his chin toward the door. She rose in almost reverent obedience, but only after looking into my eyes with a half-smile and caressing my cheek with one gentle finger. "Goodbye, Father Whatever-Your-Name-Is. May we meet again in happier times. I wish you strength and healing." "M-my na-…" I got no farther. I had floated too far away, wafted on a billow of pipe smoke. Hazy longing and regret possessed me as they crossed the threshold, and then there was only emptiness and the white moonlight. Had they been real? Was my drifting and distant self real? Did it matter? Did anything matter? The heat of noon moved in a stifling wave through the open door. It must be the following day, though perhaps more time had passed since that night, I wasn't sure. I moved to sit up, but a great bone-weariness weighed like a sandbag on my chest. I must have cried out something in German or Spanish like, "My God, help me! Blessed Virgin, have pity!" because the old woman's huddled form darkened the door. "Ah! You awake, Father." She spoke broken Spanish and her voice creaked as if rarely used, as rusty as the hinges on the warped door to this pitiful adobe cell. "You try eat now!" I lay still, watching as she bustled to the oven where a few coals still glowed. She fetched a bowl, wiped the dust and sand out of it with her skirt, and dished up steaming liquid with a crude wooden ladle. She brought the bowl to my side and sat where the red-haired vision had stroked my face. Was it the night before? Was it ever? "Look," she said, "I cook this with slice nopalitos. That thicken it and soothe your insides." She held up a spoonful. I smelled boiled jerky, a sweet-sour odor of the sliced prickly pear pads, not unpleasant, and the scent of wet clay—the bowl she'd used. I sipped the liquid and found it palatable. She'd added salt, abundant in Sonora and often of high quality, so the brew was properly seasoned, though it could have used some herbs. I was not critical, but signaled I'd gladly take more. After I finished the soup, Jacinta fed me pinole mixed with chia seed that lent the mush a nutty flavor, sweetened with pinkish syrup made from saguaro fruit, the same syrup that had counteracted the bitter potion given me during the night. I must have drifted off to sleep after eating, for when Jacinta shook my shoulder the light had changed, slanting through the door with an orange glow. "Time for powder," she told me. Once again, I drank the brew and once again fell asleep. Jacinta became my lifeline. She bathed me as she'd no doubt bathed many an ailing child, removed my slops, helped me sit up, and kept me from falling when I took a few hesitant steps. Her attitude was gentle and matter-of-fact, never inappropriate, never short-tempered. I passed my days in limbo—I have no idea how many. At times I tried to meditate, to pray. But in the middle of an important thought or inwardly spoken phrase, I'd wake to realize that my mind had inserted ragged scraps of dreams: images of a skulking coyote, a scene from my childhood—my widowed mother, her head bowed in prayer, sitting at breakfast with my sister Isabella and me in our dining room in Mannheim—and I would bring my mind back to my prayer only to drift away again. Or, I would be reading my breviary with what I thought was utmost concentration, only to find it fallen to the floor, released by my limp fingers. As I improved, my limbo became hellish, because I was not strong enough to be up and around, yet was too alert to sleep the hours and days away. There was no one to talk to, since Jacinta, even if she could have understood me, was too busy to sit and listen. Instead, I lay and considered my situation. I'd left my mission at Atí because I believed I had to go, but now I doubted my decision. Had I improved my circumstances? I'd almost died getting here. Was the effort worthwhile? "Is he drunk?" The first question I'd heard when the Pimas saved me still echoed in my mind. They must have been thinking of poor Gustav, who'd been missionary priest here at Los Santos Ángeles de Guevavi Mission before me. My brother in Christ, Father Gustavo Holzmann, a far worthier man than I, had been removed from his post for drinking any alcohol he could lay his hands on. The stress of our lonely mission life had broken him. What irony! I was his replacement, a man as broken as he. Joseph, the medicine man at Atí Mission, had been my strongest ally. He had helped me attract other Pimas to the mission, more than tripling the population of new converts in the five years since I began my work there, in 1756. That was before I fell ill with this disease some call malaria, which erupted without warning after seven years of perfect health. He had fixed me with his kindly gaze, telling me I'd surely die if I stayed there. I trusted him when he blamed the bad water I'd been drinking. I needed to get away from that. To save myself, I requested my transfer from the Jesuit Father Provincial in the capital, México. During one of my 'well' periods before I left Atí, I made the grueling journey across two chains of mountains to reach Oposura Mission, the Society's respite home for ailing or exhausted colleagues, to see Father Gustav. He'd already been removed from Guevavi Mission a couple of months before that. I knew by then that my transfer to his former mission had been approved and was anxious to talk to him about Guevavi. I needn't have hurried; three more months passed before the official documents arrived. I found him on a bench in the patio of the magnificent Nuestra Señora de la Candelaria Church, sitting alone, staring into space. He gave a start, then rose from the bench and faced me. I was shocked. I'd seen him last at our annual meeting at Mátape. He'd not looked well even then, but now his face was haggard and gray, and his worn black robe hung loose on his bony frame. I held out my hand, seeing as well as feeling the marked tremor as his hand clasped mine. "Ygnacio…" He called me by my Spanish name even though he continued in our native German. "The rumors say you'll be taking my place at Guevavi. I guess I made a pretty big mess of things. But the Apaches finished us all off. Gave the mission a death blow." His hand went limp, though the tremor continued as he withdrew it. His voice trailed off into silence and his gaze drifted away, half focused. I decided to be direct. It would do no good to pretend I didn't know about the alcohol. "Let's sit down, Gustav. You can see I'm not in great shape, either. I should be here instead of taking your place at Guevavi, but the Provincial is sending me, so I need to find out about the mission. About you, too. I know there was a problem with drinking, but what happened?" Gustav glanced at my face, looking drained, distant, and almost indifferent. "I took over from Miguel Gerstner. He'd been building up the church and the compound of buildings attached to it, and he'd increased the population of Upper Pimas. I began well, though I sensed that the neophytes weren't happy to lose Miguel…. Oh, God, Ignaz! Have you ever been so lonely, so desperate to talk to somebody from your own people that you could… almost… die?" The wrenching outcry shook me. "Yes of course, Gustav, all of us out here have felt like that." "It got bad. It interfered with my work, with the construction, catechism—everything. And then I got to know Patrick O'Meara from the ranch about two leagues to the west. I thought he was a godsend. We could laugh together, could discuss anything and everything… but then tequila came into the picture." Gustav fell silent until I prompted him. "Yes, tequila?" "Yes, God forgive me! I didn't know I was a drunk until I met Patrick. Communion wine hadn't triggered it, but once I had tequila I found I couldn't control it. Patrick thought it was amusing. He was being generous. Didn't know he was destroying me. Once that started, I ran into all kinds of problems: an Apache raid, disease and death among my people, and I was more of a burden to them than a help. Finally, the Father Visitor came to their rescue. He could see how I'd failed… let the place run down." He paused with bowed head, his fists clenched in his lap, eyes squeezed shut. I wanted to reach out to him, but stifled the impulse. I waited. "Even then," he continued at last, "the mission still had some cattle and a few horses. We depended on those cattle to supplement what we were growing—you know, corn, chile, squash, beans, melons, the usual. The Apaches raided again and wiped us out. Took most of the cattle and all the horses. My people began to leave the mission. They'd despaired, you see." "And that was when the drinking went out of control?" "It was way beyond control before that, but that was the last straw. Father Johann Nentwig, our Father Visitor, took pity on me—on them—and removed me. By then, the population was down to about twelve families. They were terrified of the Apaches, and knew I was no protection for them. The Apaches and I destroyed that mission, Ignaz." 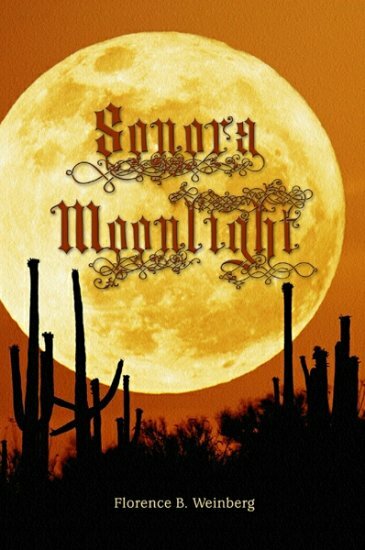 Sonora Moonlight Copyright © 2008. Florence Byham Weinberg. All rights reserved by the author. Please do not copy without permission. Cover design © 2008 Ardy M. Scott. All rights reserved.